Though now for the first time, together with hitherto unpublished poems, collected into a separate volume, several of the following have already appeared among other surroundings and at different periods. This must be accepted as an excuse should occasional repetitions of thought and expression seem to demand an apology. If on some ears, freshly attuned to the glad harmonies of a life fully consecrated, “Chimes among the Shadows” should, even as those of childhood, fall as memorial music only, they may not as such be without their sacredness of association. And in their hearts for whom, because of Light and Love behind the cloud, the consecrated path is shaded by bereavement, loneliness, suffering, may “the everlasting chime” make heavenly melody, until, in its fullest sense, the Day dawn, and the shadows flee away. 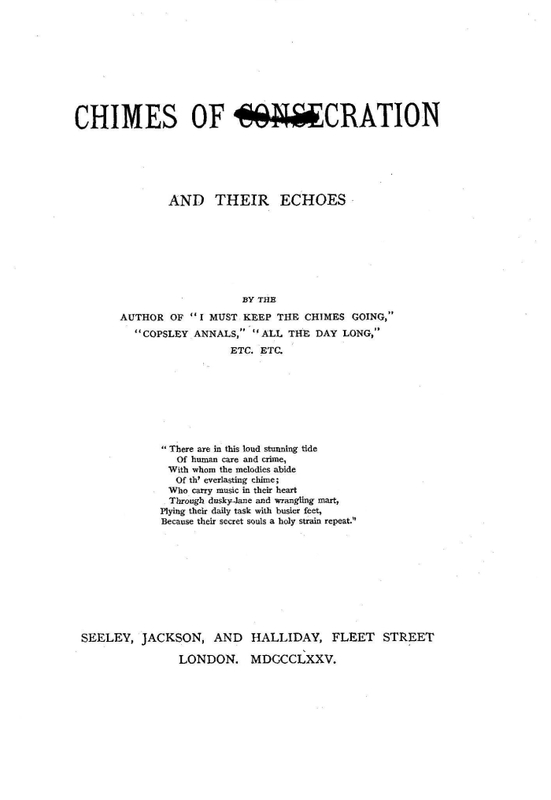 Emily E. S. Elliott was also the author of Chimes for Daily Service (1880). This volume contained 71 hymns arranged in two parts, the second of which was published separately as a large-print book for hospitals with the title Under the Pillow. Many of her hymns were written for the choir at St. Mark's Church, Brighton, England, where her father, Rev. Edward Bishop Elliott, was the rector; Rev. Elliott was the author of Horae Apocalypticae. Ms. Elliott was also the author of the translation "Stilly Night, Holy Night" (1858). See: Silent Night, Holy Night - Notes. Associated with the Evangelical Party of the Anglican Church (also known as the "Low Church Party"), she spent her life working with rescue missions and children in their Sunday Schools. For six years she edited a magazine called the Church Missionary Juvenile Instructor. She was a niece of Charlotte Elliott, author of the hymn, "Just as I Am." Two of Emily's uncles were Evangelical Party ministers, including Rev. Henry Venn Elliott, author of the hymn "Sun Of My Soul," based on a poem by Rev. John Keble in The Christian Year." The Old Year and the New. "The Watchman said, ‘The Morning cometh.’ "
O, come to my heart, Lord Jesus! Let Thy voice call me home, saying, “Yet there is room! When He cometh and calleth for me. See: Thou Didst Leave Thy Throne. One who whispers, “Look to Me! Echoed clear from Bethlehem’s hill. Which our waiting hearts receive. Take thy Christmas joy from Him. Far and near the Christmas chimes. Lone the days and long the nights? Are these thy words, oh, mourner? Are these thy thoughts, my friend? In the twilight’s gathering gloom. IS there gladness in the house? Is there weeping in the house? Oh weary, weep no more! Is there scarceness in the house? Yet rise in hope once more! And He Himself was poor. Is there stillness in the house? A shadow on the floor? Where the mourners come and go? Christ, who wept, is at the door. Of a nearer, better Friend. He hath suffered—He can heal. Dost thou weep to be forgiven? From thy load of sins set free? Bore their chastisement for thee. Thine a wearied, aching head? I know all—yet bring thee rest. Keep with thee thy Christmas Day. Fear not sin and care to tell. Fear thou not: thy King is here! Keep with Him thy Christmas Day! For a life with Him. Which our waiting eyes behold. Ere the Bridegroom shall draw nigh? And the Bridegroom is drawing nigh. And the banner of God unfurl’d. And the voice that we long to hear. For the morn of the marriage-feast. Where are the children to bring them in? Pile them steadily, higher and higher! Here is the youngest! let him begin! Than this, which the woodman has toiled to win. Our gladness an echo of Christmas chimes. Let our Christmas hearth be a holy rood! Let kindly words tell of love to all. Open the door to the carol singers! Let the Bethlehem hymn sound from hearth and hail. Thou hast no frown for us, cold December! Let us breathe a prayer on this Christmas Eve! I think of thee, my friend. Best and calm in thy home abound! Heaven’s blessing light up thy way for thee! I wish thee joy, my friend. Who was once a Child. Had been for His wants to care. Whose offering was not in vain. Would have knelt at the Saviour’s feet. I wish we could see Him here! Some work for the Master here! Be it ours Thy will to know! Still wanders the Son of God. Is turning Christ from the door. When given for His dear sake. To all who for mercy cry. To sit up, and to see the old year die. As the last stroke died of the midnight chimes. And how cross we should grow if we sat up late. And it’s very seldom that New Years come. We peeped out to see if the night was fine. Without one good-bye, would have been unkind. Everything knew that the year was dying. Seemed stealing past towards the old grey arches. We said, when the good old year should die. And at last we both of us fell asleep. A spotless robe for the New Year’s christening. To where earth and leaves were all brown and sodden? At the pure white glitter of snow untrodden. In foot-prints left on the spotless snow. Till the sun shall have melted the ice away. That things this morning should happen so,—. And not a foot-print have marked the snow. Like a picture to me of the opening year. The path which we all shall so soon be treading. For old years never are new again. Better by far than I kept the last! He, only, aright can my steps uphold. He Himself can wash me whiter than snow. And I want to wish you a Happy New Year. Wake up, Janie, and see the sight! Wake up, Janie, and look at the snow! It’s a happy New Year to us, Janie, now! Till his Christmas songs are ready. Ere the twenty-fifth of December. Into gentle care for others? Will not find the winter dreary. In the light of Christmas Eve. And with hopes for a glad New Year! Echoes of the angels’ hymn. With the sound of the midnight chimes. And joys from a Land afar! Shine soft o’er a glad New Year! Louis F. Benson, Studies of Familiar Hymns, First Series. Philadelphia: The Westminster Press, 1924. Rev. Duncan Campbell, Hymns and Hymn Makers. London: A & C. Black, 1908. Cyberhymnal: Emily Elizabeth Steele Elliott, citing Charles S. Nutter and Wilbur F. Tillett, The Hymns and Hymn Writers of the Church. New York: The Methodist Book Concern, 1911. John Julian, Dictionary of Hymnology, January, 1892. Robert Guy McCutchan, Our Hymnody: A Manual of the Methodist Church. Second Edition. New York: Abingdon Press, 1937. “Let us keep the feast” (H Communion). First published in The Feast of Sacrifice and The Feast of Remembrance, 1865. "Brothers, sisters, pray for us." [Missionaries' Farewell.] Appeared in the C. M. Gleaner, Sept. 1896, p. 142, and entitled “The Missionaries' Departing Petition.” In the Church Miss. H. Bk..,1899. "Rabboni, Master, we have heard." [Consecration of Self to Duty.] In the C. M. Gleaner, Dec. 1895, p. 195. It was sung for the first time at the Gleaners' Union Anniversary, 1895. In the Church Miss. H. Bk., 1899. "Full consecration! Heart and spirit yielded." [Full Consecration.] Given in Hymns of Consecration and Faith, 1902. "They come and go, the seasons fair." [Second Advent.] In the C. M. Gleaner, Nov. 1891, p. 172, as “What will be when the King comes?” It was sung for the first time at the Gleaners' Union Anniversary, Oct. 30, 1891. In the Church Miss. H. Bk., 1899.